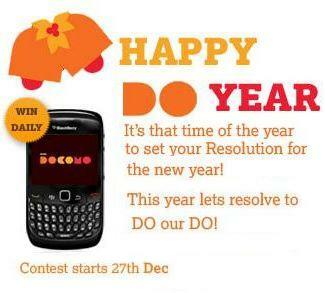 To celebrate the New Year resolutions people make and the spirit of sticking by them, TATA DOCOMO the GSM mobile service of Tata Teleservices Limited’s (TTSL) has introduced a unique ‘Happy DO Year’ Contest! The objective of the contest is to make people stick to their New Year resolutions this year with extra commitment, thus urging them to transform into ‘DOers’ this ‘DO Year’! Participants will be required to disclose their New Year resolutions along with innovative ways of sticking to them. This contest will be promoted and played across three social networks; Facebook, Orkut and Twitter. The participants will be first required to add or follow the official TATA DOCOMO ID on all or any one of the three social networks. Thereafter they must post their DO Year resolutions along with an innovative way of sticking to them either directly on these social networks or on the contest page itself. The contest will run from the 27th of December 2009 till the 4th of January 2010. Everyday the nominated jury members will select one winning entry out of all eligible entries for that day and the winner will receive a BlackBerry Gemini 8520 on TATA DOCOMO. TATA DOCOMO wants 2010 to be the year where people transform in to DOers and pursue their chosen ‘DO’s’ with renewed vigor and commitment! Docomo service in orissa is very poor.Just try to make it better rather than this phaltu stuff. Hey when are you guys launching in Delhi NCR??? Is it in month of Jan2010?? ?